It's time to rekindle Monday Musings and this week we'll share some idle thoughts on Duke Football and Basketball. The football team was the victim of an officiating snafu that has the nation talking. 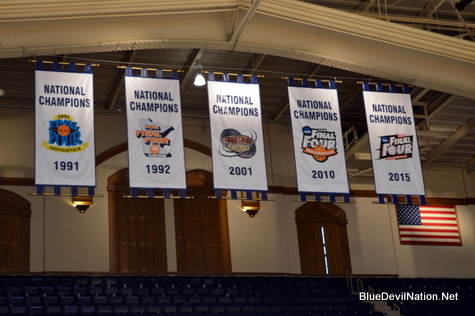 Meanwhile, Duke Basketball played their first game under their 2015 National Championship banner. As we all know by now, the Atlantic Coast Conference suspended the officiating crew that called the Duke-Miami game this past Saturday. That's not much of a consolation to the Duke Football program in that they have an undeserved blemish in the loss column which in turn caused the team to fall out oft he national rankings. There are quite simply no adequate apologies for not getting this game right from league officials in that the outcome may well prevent the team from winning their division. Duke is also forced to deal with unnecessary bitterness from the loss and must deal with the psychological aspects from the fiasco. All in all, they have been forced fed a bitter pill they are expected to swallow and move on. There is no sugar coating the fact that this falls far to the left of the fairness meter and it will take a while to shake the result off. And if that is not bad enough, the program will be expected to endure the replays for years to come in that their will not be an accompanying asterisk beside the play or their 6-2 record. What is even more disturbing is that the team is a loss away from falling deep into the division pack should other teams win. The Blue Devils have no choice other than to move on and with North Carolina looming, they'd better do so and soon. Coach David Cutcliffe knows he has to get back to work and soon. In fact, he said that he would let the university continue to look into the situation as he did just that in his Sunday call in show with members of the media. Duke cannot lay all the blame on one play, meaning they must improve in certain areas on the field as a team and a staff. The Blue Devils should have won consecutive thrillers to be sure, but had the margin been more manageable the games would not come down to a single play. A season ago, North Carolina came into Wallace Wade pumped up and prepared. The Tar Heels put their collective knees in the Blue Devils chest on their way to a convincing victory. This seasons version of North Carolina football is even better where their offense can score on practically any defensive scheme in bunches. Their defense also rose to the occasion by playing perhaps their best game of the season. The Blue Devils will have to focus in and soon for all indications are that the Tar Heels have as expected circled this game on their calendar. This would have been a game against two 7-1 teams, but now Duke finds themselves in a dreaded must win situation due to the tainted loss to Miami. The Duke Basketball team rolled over Florida Southern, scoring in bunches in Cameron Indoor Stadium this past Friday. Quite frankly, it was more of a first view for the fan base than an accurate barometer on what to expect this coming season. We are likely to see Mike Krzyzzewski and his staff settle in on a core group of players sooner than one might expect. The lack of size of their opponent dictated smaller lineups at times which made the big man rotation different from what we could see. The freshman all looked good while the veterans showed they were indeed the core of the team in the early season contest. Matt Jones suffered what could be a nagging groin injury while Grayson Allen had some trouble adjusting to the surprise of many. Duke will take to the court again this Wednesday evening against Livingstone. The regular season begins with back to back games on November 13th and 14th against Siena and Bryant. The Blue Devils will seek to find more team chemistry in said games before their November 17th meeting with Kentucky in the State Farm Champions Classic. The only way to see the exhibition game with Livingstone is through BDN + via subscription on the GoDuke.com site. Saturdays football game versus UNC will kickoff at 12 noon on ESPN 2. The first of the regular season games for men's basketball versus Siena will be on ESPNU. The next evening will provide more of a challenge for viewers in that the Bryant game will be the only contest this season carried on ESPN 3.